* Learn about ASTM testing and the time and conditions it takes for these products to biodegrade. Biodegradable Project Folders are made from acid-free polypropylene which contains an additional additive that allows it to biodegrade when tested according to the ASTM D5511. * Heavyweight, acid-free polypropylene. Open two sides with thumb cut front for easy access to documents. 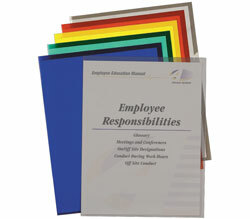 Unique corner design allows folders to expand to hold up to 100 pages. Reduced glare. For 11 x 8-1/2 document storage. 25/BX. * Learn about ASTM testing and the time and conditions it takes for these products to biodegrade..